Are you having the same trouble with erasing your iPhone? When you need to erase your iPhone, then you just find out that you can’t do it? Don’t worry, here in this article you will find out why “I Can’t Erase My iPhone” and the way to erase it. It won’t require you breaking a sweat, thanks to the emergence of new software. At some point, you will need to erase your iPhone for different reasons, it could be because your iPhone is freezing or crashing, or because it is finding it hard executing a particular app when that happens, or because you see a blank screen, or having problems with the touchscreen and keypad. Especially when you need to sell your iPhone or give away your iPhone, then you will need to erase your iPhone before that. 1. If you can’t erase your iPhone from settings, then just restart it and try again. 2. If you can’t erase your iPhone using iTunes, then you can use an erasing tool. 3. If you can’t erase your iPhone via iCloud, please make sure that you have turned on the Find My iPhone feature and put in the right Apple ID and password. For whatever reason, erasing your iPhone is inevitable. When it gets to this point, there are some things that you can do to help you out, take, for instance, you can restart the phone, make use of iCloud, an erasing tool (like the iMyFone Umate Pro), or your iTunes. Like I said in the past, there are things you can do to erase your iPhone with ease, one of which is using the iMyFone Umate Pro data eraser. If you can’t delete it, it means you need an external force to do that for you. When I can’t erase my iPhone, iMyFone Umate Pro help me solve the problem. What does the iMyFone Umate Pro do? Well, it helps to wipe your iDevice, especially those personal information like text messages, call history, and other sensitive information that you’d like to clean off your phone. So, what's really special about the iMyFone Umte Pro? Let’s find out together. It helps to erase your iPhone easily and completely when you can’t do it by yourself. Allow you to erase all data, including real and ones you’ve deleted. You can also erase the data you want to erase selectively as you wish. It’s compatible with all the iPhone models and even the latest iOS 12 and iPhone Xs/Xs Max/XR. 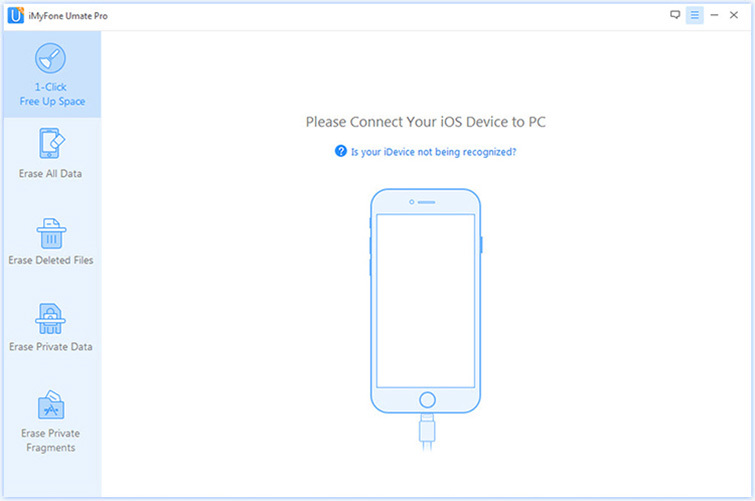 Step 1: After downloaded the program, connect iPhone to the PC. 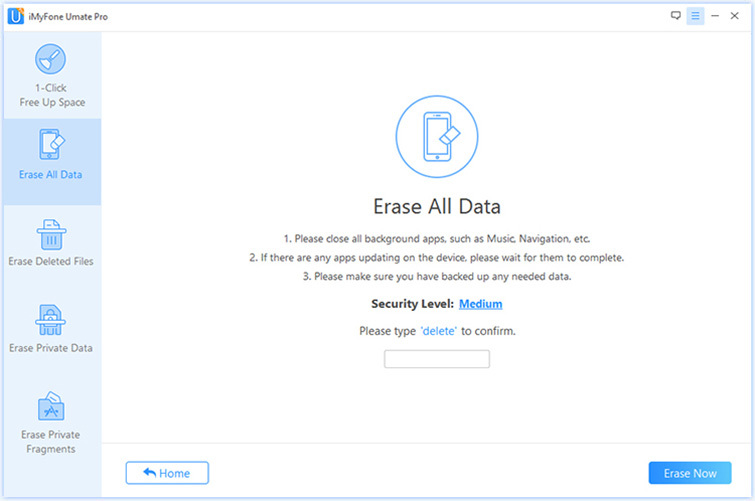 Step 2: After successfully connected to PC, choose the “Erase All Data” mode. Then click on the “Erase” button. Step 3: Typing ‘delete’ into the box to confirm the security level and let it start the process. Step 4: At this point, you should have typed in the ‘delete’ text into the box and confirmed the action, Click Erase Now button to erase all data on the device. Note: Remember, doing this would mean permanently deleting the data and this action cannot be reversed once you’ve done it. I will teach you how to erase your iPhone using iCloud. 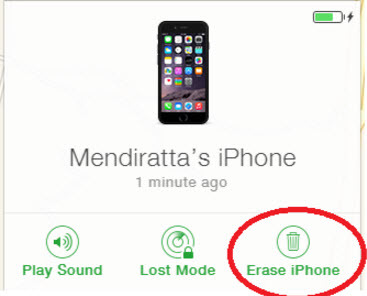 This method is only for those who have turned on the Find My iPhone feature on iPhone. It’s also suitable for those who has already sold out or given away their phones. Let’s see how it works. Step 1. Go to icloud.com/#find from your PC or make use of someone’s iDevice via the Apple ID and Password. Step 2. Once you are logged in, select All Devices at the top. Step 3. Choose your iPhone from the list and click on Erase iPhone to erase your iPhone. If you can still connect to iTunes, then you can use it to erase your iPhone. If you can’t use iTunes, then just use the erasing tool. Step 1: Open iTunes on your PC and attach your iPhone using the USB cable provided. Step 2: Wait for the iPhone’s icon to appear in the iTunes interface and click on the icon to open your iPhones summary menu. Step 3: Click on “Restore iPhone”, then your iPhone will be erased. Note: It’s important to know that if you need to sell your iPhone you will need to erase all your personal data complete, which can’t be done just by iCloud or iTunes. 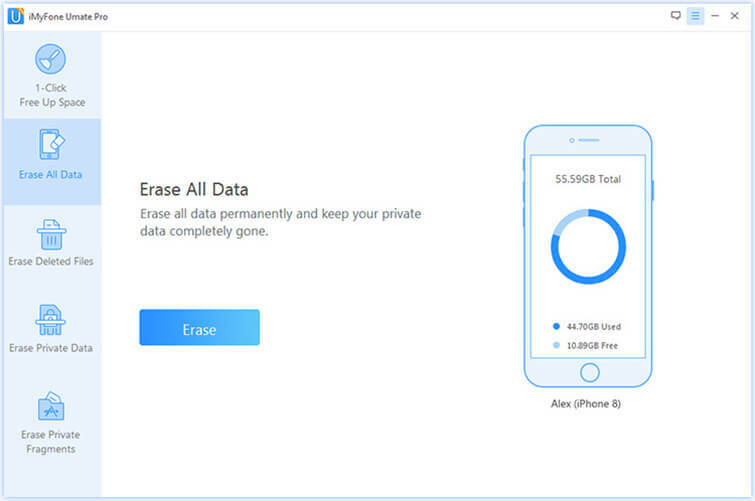 You will need an erasing tool that would destroy your data permanently without any chance of recovery, and then you can sell your iPhone without worrying a thing. Now you know you need not worry when you have a problem erasing your iPhone, there are lots of ways to get it done. But which one is the easiest? I would choose the iMyFone Umate Pro when I can’t erase my iPhone. Why is this the best option? For me, I would say you been able to do all of these offline and you don’t need to log in into an account; all you need are your iPhone and a PC.